Aw!~ the last one of little Marik is soooooo Kawaii!! Actually I believe you NECROED a Marik thread that hadn't been active for about 6 months. That's why it was locked. So who likes the angstshipping then? Do you reckon Malik's on the gay side of life or straight? 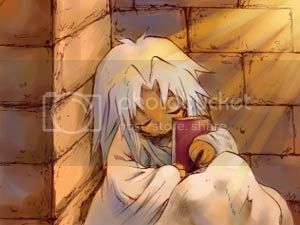 Okay, that first picture of Y.Marik and Marik. Unless Regular Marik is laying in a pool of his own blood, it doesn't work. I personally like Malik with Ryou so I'm a bit biased about what his orientation might be. And now for some... PSYCOSHIPPING! Love them cheese grating abs! What, someone else has played Xenogears? Sort of a game version of Evangelion (Purple Robot, lead couple were totally older Shinji and Asuka knock-offs, Evil wanting to merge everything into a god, was rushed at the end)? One of the only games in history where the lead couple actually got together (AND got it on). Someone here besides me has ACTUALLY played it? 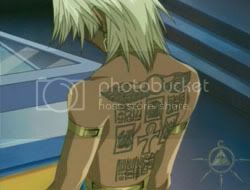 "Today on Miami Ink: Marik's family are forcing him to get a tattoo, it's a religious tradition showing their families devotion to the Pharoah. Marik doesn't want a tattoo, he thinks they're stupid, he wants a motor-bike, but I think we can ruin his dreams by tying him down and cutting some sense into him. Also, I act like a prick, while employee 3 brings his long-lost son to work"
The music is sweet :) what is it called, Loituma? But he can't be cool on a motorbike without a tattoo!! And for the record, I've played Xenogears too! He should try and recover his relashionship with that wall.